CHICAGO – The American Association of School Librarians (AASL) announced its 2013 Best Websites for Teaching & Learning at the American Library Association (ALA) Annual Conference in Chicago, Ill. The annual list honors the 25 Internet sites which provide enhanced learning and curriculum development for school librarians and their teacher collaborators. 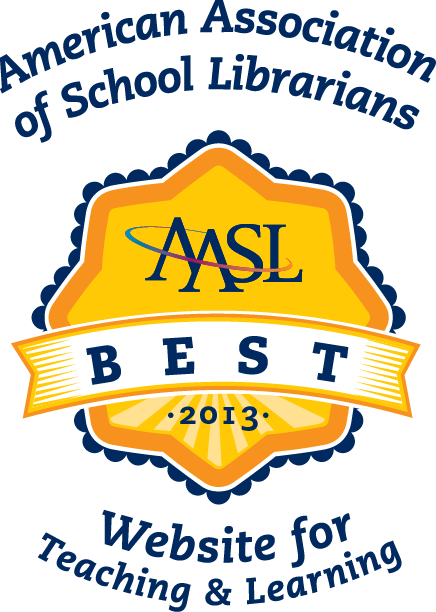 Now in its fifth year, the list is considered the "best of the best" by AASL. The Best Websites for Teaching & Learning provide a foundation to support AASL's learning standards and each website is linked to one or more of the four strands of the “Standards for the 21st-Century Learner” – skills, dispositions in action, responsibilities and self-assessment strategies. Best Websites are free, Web-based sites that are user-friendly and encourage a community of learners to explore and discover. The Best Websites for Teaching & Learning list is based on feedback and nominations from AASL members. School librarians can nominate their most used websites at www.ala.org/aasl/bestlist. Nominations to be considered for recognition at the 2014 ALA Annual Conference must be submitted by March 31, 2014.